It may sound judgmental, but “lower” actually refers to organisms that developed lower, or earlier, on the evolutionary ladder than forbs, grasses and trees. They were some of the first organisms to anchor themselves onto rocks and soils, which helped limit erosion. They were also some of the first to generate energy through photosynthesis and recycle nutrients into the soil for use by other organisms. These basic processes eventually created conditions that allowed more complex plants to develop and flourish. The general definition of “lower” varies from source to source, but for our purposes, it includes ferns and fern allies, mosses, liverworts, and hornworts, algae, fungi and lichens. Like forbs, grasses and trees, ferns are “vascular” plants. They have special tissues that transport fluids and nutrients internally. They also have true root systems, leaves and stems. However, ferns are unlike most plants because they do not produce flowers and seeds. Instead, they use spores to reproduce. 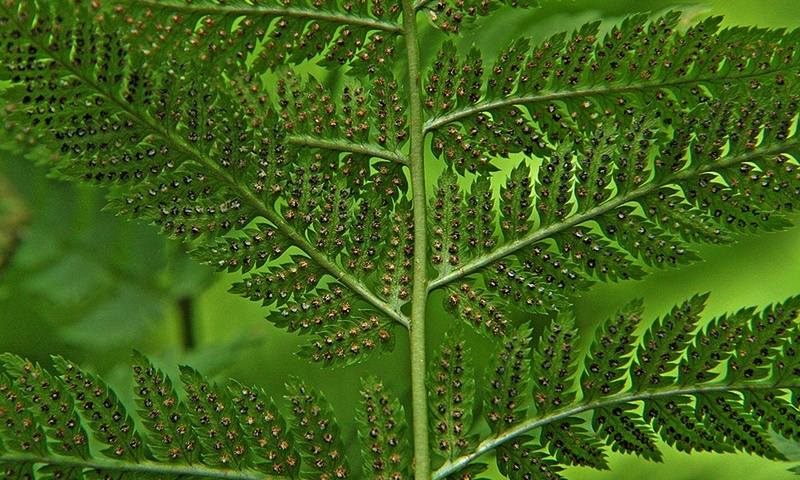 The spores that ferns produce are different than seeds. They do not store as many nutrients as seeds or have protective coverings. To compensate, ferns produce large amounts of spores to ensure that some will survive until germination. Additionally, a spore contains everything it needs to grow into a “sporophyte” and ultimately into a mature fern. Unlike a seed, it doesn’t need to pollinate with another part of the fern before it can reach that stage. Fern allies, such as quillworts, horsetails (also called scouring rushes) and club mosses, are similar to ferns but have enough genetic differences that ecologists have placed them in their own plant divisions. Mosses, liverworts and hornworts are collectively called “bryophytes.” Bryophytes are nonvascular plants: They do not have special tissues — tissues that botanists call “xylem” and “phloem” — to transport fluids and nutrients internally. Additionally, bryophytes do not produce flowers and seeds. Instead, like ferns, they use spores to reproduce. Of the bryophytes, mosses are the most prevalent. Forest Preserve District ecologists and volunteers have identified 225 in DuPage County in a range of locations from dry surfaces, trees and rocks to underwater niches. Some grow almost anywhere while others only inhabit certain ecosystems. Mosses are typically soft plants that grow in clumps or mats. Like other plants, they produce chlorophyll and undergo photosynthesis, but they do not have true roots. They instead have multicelled, rootlike appendages called “rhizoids,” which anchor the plants and take in water and minerals. Because rhizoids are less efficient than roots, mosses generally prefer damp places with low light. When dry, they can go dormant, drawing moisture and nutrients from the green portion of the plant back in the rhizoids, which causes their leaflike structures to curl. When moist conditions return, they spring back to life, turn green and grow. Their spores grow in beaklike capsules and are usually dispersed by the wind. Because of mosses’ acute sensitivity to pollution, they are potential indicators of the health of natural areas. Like mosses, liverworts produce spores and live in shady, damp habitats, but they are not as biologically complex as mosses. Though not always the case, a lack of clearly differentiated stemlike and leaflike structures likely means a plant is a liverwort and not a moss. The liver-shaped, leaflike structures on some liverworts give this division of plants its common name. There are 118 species of liverworts in Illinois, but only about 12 have been seen in Du Page County. The third division of bryophytes, hornworts, is quite rare in Illinois; ecologists have recorded only three species in the state and only one in the Chicago region. Hornworts resemble liverworts but produce their spores on long horn-shaped structures that grow from the base of the plants, among other differences. These structures give this division of plants its common name. Algae are a large group of generally aquatic plants. Like bryophytes, algae are nonvascular: They lack the xylem and phloem tissues that transport fluids and nutrients internally. They do not have leaves, roots or flowers, nor do they have rhizoids or leaflike structures like some nonvascular plants. Algae do, however, use chlorophyll to convert sunlight into energy. They range in size from single-cell organisms to larger, more complex ones, and Forest Preserve District ecologists have documented over 40 species in DuPage County. Although fungi are featured in this section for simplicity’s sake, they are not technically plants. Similar to plants, animals and bacteria, fungi make up their own group of related organisms called a “kingdom.” Ecologists have identified over 1,000 species of fungi in the Chicago area. Fungi, which include molds, yeasts and mushrooms, are primarily different from plants because they have different cellular compositions and different ancestors. Fungi also do not have roots, leaves, flowers or stems and do not produce chlorophyll, which some plants use to turn sunlight into energy. Fungi instead get nutrients from the live or dead tissues of plants and animals, most from decaying matter. A fungus’s main body, the “mycelium,” secrets enzymes that the fungus uses to digest its surroundings. Fungi play important environmental roles because they decompose organic matter and recycle nutrients. A lichen is actually made up of two different organisms: a fungus and either an alga or cyanobacterium. The two parts live in a symbiotic relationship, the survival of each dependent on a particular resource from the other. The alga or bacterium manufactures food through photosynthesis. This feeds the fungus, which in turn provides the bulk of the lichen’s body. The two organisms create a “thallus,” a unique body that resembles neither individual species. Lichens do not have roots and do not need a continuous supply of water. This gives them the ability to colonize locations that more developed plants cannot, such as bare rock, sterile ground, eroded soil and artificial structures. Lichens occur in some of the most extreme environments on earth but are vulnerable to environmental disturbance and are useful indicators of pollution. Forest Preserve District ecologists, volunteers and researchers have documented over 200 species of lichens in DuPage County..